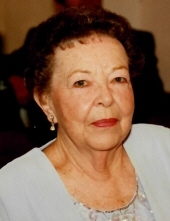 Hazel Ann Klein ( nee McCafferty ), 97, died Monday, March 25, 2019. Born in Lyndhurst, she lived in Newark and North Arlington before moving to Dallas, Texas in 2000. She worked in the accounting department at both Prudential Insurance Company and Lockheed for many years before retiring in 1987. Hazel was the beloved wife of the late Nicholas J. Klein ( a former Newark resident and proud World War II Veteran) ; the devoted mother of Tom Klein and his wife Diana; and the cherished grandmother of Nicole Alejandra and Sarah Angelica Klein all of Dallas, Texas. Relatives and friends are invited to attend the Funeral from the Parow Funeral Home 185 Ridge Rd., North Arlington on Friday, March 29th at 8:45 a.m. thence to Our Lady Queen of Peace Church, North Arlington for the Funeral Mass at 9:45 a.m. Interment Holy Cross Cemetery, North Arlington. The family will receive friends on Thursday 4-8 p.m. In lieu of flowers the family would appreciate donations made to Catholic Charities. To send flowers or a remembrance gift to the family of Hazel Ann Klein, please visit our Tribute Store. "Email Address" would like to share the life celebration of Hazel Ann Klein. Click on the "link" to go to share a favorite memory or leave a condolence message for the family.